BE THE ULTIMATE YOU WITH B-Nergetics Series, Made in UK. 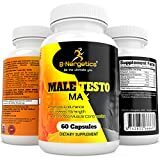 Combines the best ingredients that may help you obtain the best results in Sexual Health, Immune Suppport, Libido Increase, Muscle Growth, Athletic Performance: N Acetyl L-Cysteine, Magnesium as Bisglycinate, Zinc as Gluconate, Vitamin D3, Vitamin B6, Selenium. Benefits: Exclusive blend of powerful natural ingredients. Stimulates libido, sexual performance, enhances athletic performance, supports muscle growth, increases energy and resistance and may boost immune system. Get stronger faster and get bigger muscles. For huge muscle gains, check also our B-Nergetics Max Strength Preworkout. Make your partner happier and happier everyday.